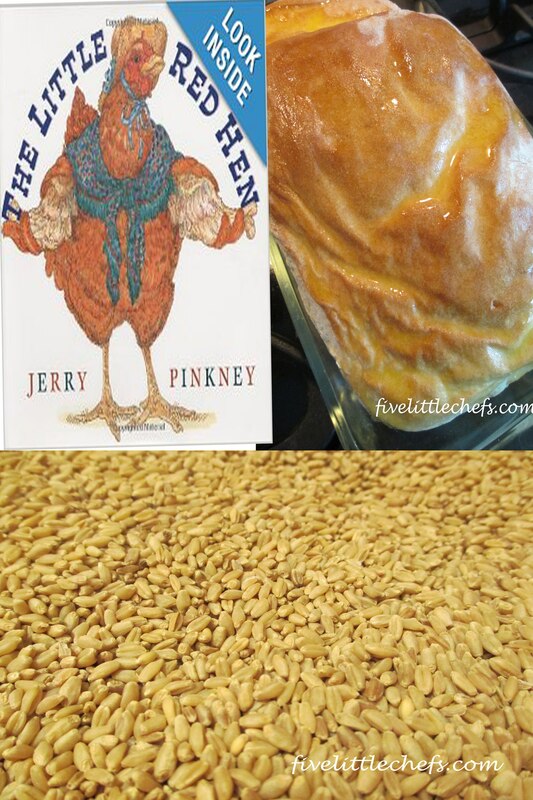 This week we read The Little Red Hen by Jerry Pinkney. This was a new book for Little Chef K. He enjoyed the illustrations of all the animals, and looked forward to the next part of the story. While looking for this book at the library we found different interpretations of the story. At the end of the book the Hen either makes bread, cake, or pizza. I like the original version of the story, so we went with the bread. The Little Red Hen is a tale loved by many generations. It has great repetition, humor, and a lesson all can relate to at the end of the book. The Hen finds some wheat kernels while on a walk, and her friends refuse to help her during the process of taking care of this wheat. In the end, her friends invite themselves to partake in the bread that she has made. This is a book that will keep readers of all ages interested and excited. After reading The Little Red Hen Little Chef K and I decided it would be fun to make bread. 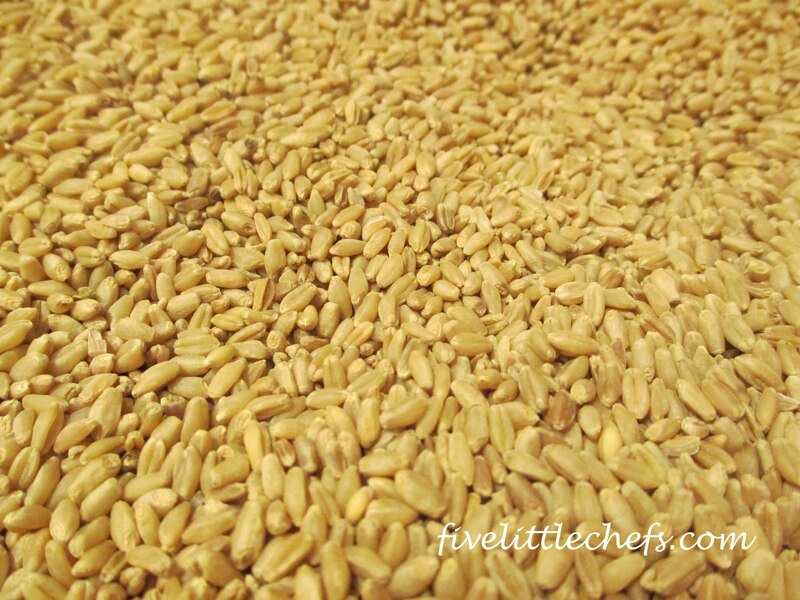 We, like the little hen, started with Grains of wheat. We had to grind the wheat down with our grinder to make wheat flour. Little Chef K thought that was the coolest thing ever and was full of questions. 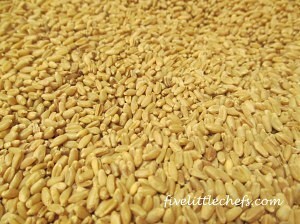 This is a great way to teach your chefs, of all ages, about wheat and what we can use wheat for. 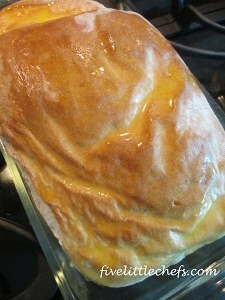 There are many recipes for bread that you can find on the internet. When we make our bread we use half white flour and half wheat flour. I’m not sure my kids would digest whole wheat bread very well. Little Chef K enjoys baking with me, so we got our aprons on and went to work. When my little chef helps me the mess is twice as big, and it takes twice as long, but it is great time for me to spend with him. When Little Chef K helps with molding the bread it never turns out the perfect shape, but we don’t mind. It’s his face as we pull it out of the oven that is priceless and makes it all worth it. We hope that you will take time to read this book and make bread with your little chefs. It is a fun experience for all, and to be able to eat it when its just out of the oven is wonderful!! No Replies to "The Little Red Hen"